That could be worked out! I love the way you have left a comment before I have finished editing my post! Had a little issue with the spacing and attaching the pdf. So if you go to my blog the pdf is now attached and everything should look nice — I think. I hope. I pray. They need to publish a new book, WordPress for Really Stupid Dummies! I’m so sorry. The link under the picture doesn’t work and I am trying to correct that, just having a bit of trouble trying to figure out how. The link in the body of the post does work. Please try again using the other link. These are so spectacular Susan. The link to the star template worked for me. Thanks! These are really beautiful, Susan! I’m inspired! Thank you. I can’t wait to try this out. Looks simple but fabulous. I just found this and clicked on the template in the body of the text and it will not connect. any thoughts on how to get the template? The template seems to be working on this end. I will go check on it again. These are just lovely! I’m wondering what size you made yours … is it the template size? Thanks! Thanks Erica. The template is the size for the small star. Around 5.5″. I did that so it would fit on the page. The large start from point to point is 7.5″ If you check back later today I will try to post a link to a larger template. That way if you don’t have a way to re-size the original template you can at least have one other size. I may be tomorrow before I have time to make it and get it up. Thank you so much! It is so thoughtful of you to post the template! I have Photoshop so I can resize. I appreciate the info and the template! BEAUTIFUL! LOVELY WORK — THANK YOU FOR THE STAR TEMPLATE AND ALL YOUR BEAUTIFUL IDEAS — WHAT LOVELY TALENT !! I’ve done a little Zen- tangling myself before and it’s so much fun to do. So satisfying! I am going to ask my family to get together and get me the kit for Christmas! I love my Zentangle box kit. I’ve even tangled on it. It is so beautiful and it provides a nice way to store all my pens and tiles. I couldn’t live without it! Can’t wait to try this. They are awesome! Thank you for sharing! Question….unlike most Zentangles that sort of roam and ramble, these have precision and repetition. Is that a feature using the template or is that your patience and skill? Susan, I want the Betsy Ross method – I remember learning it but have tried over the years to do it again, with no success. I know its simple….can you share that too? I could not pull up the template or directions. I love the stars! Any ideas would be appreciated. Your stars are gorgeous! Thanks for taking time to make the PDF. Thank you so much for the star template. The Valley Calligraphy Guild of Eugene, OR is having their Holiday Party tomorrow night and the decoration theme is “stars”. 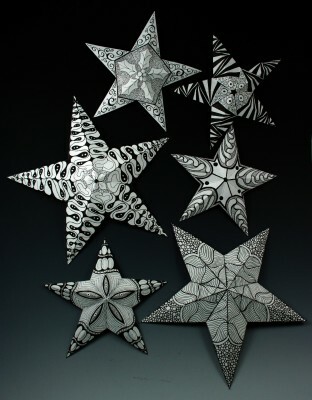 I’ve got to get busy to get some of these Zentangle stars ready to be a part of the table decorations. What a terrific idea! The stars are outrageously beautiful. I have all the right paper, pens, etc. The only thing I don’t have is an imagination and how to get started. Is there someplace that will get me going as far as the tangle designs are concerned? The stars a just beautiful, I am just starting to Zentangle so I’m sure these are far to advanced for now but wanted to save the star pattern for later but I can not get them to down load. Thank you for sharing. I will try again later. It’s virtually faster to make multiple sizes than using the computer! Ahhh simplicity! Thanks too for being willing to post the directions but we’d all save you a lot of trouble if we’d google it. I’d like to hear more about how you got the consistent repetition. They really are fun. Hope to incorporate some into my gift wrap. Have one granddaughter who LOVES Zentangles so she, at least, will find one on her gift. I’m sure mine would twirl around and show the backside on the tree instead. I might have to figure out how to put two back to back, so they are truely 3 dimentional. What a wonderful story and such a lovely idea!! I am going to make some foe my kids school Christmas tree!! Susan, Thanks for the great star ideas with Zentangle!!!! The Spellbinders Star dies would also work here for a pattern…several different sizes. I’ve taken a class….loved the teacher and the class, I am an artist and retailer, sell Zentangle books…and enjoy tanglepatterns.com….and am working on new patterns often. do you tangle before you fold??????? I score the backside of the star and fold it. I then flatten it to tangle. Folding it first just guarantee’s that the star will fold correctly after you have tangled. It would be awful to spend time drawing gorgeous tangles and then not have the star fold correctly. I have never had a star not fold correctly and there shouldn’t be any problem as long as you have scored the backside accurately. I just tend to always err on the side of caution. Good luck making your stars! A beautiful tribute to your mother and how nice that time has been kind to her art! Thank you for the template, your stars are beautiful. Hope you appreciate! Thank you for sharing! Adele, your stars are amazing! Gorgeous colors! Thank you so much for sharing and I hope you have a wonderful holiday season! Thank you so much for the star. I made some and it was great fun! Aslways in Zentangle they became very different. I made some photo’s of mine and will send one if I can find your emailadress. Annemarie, I would LOVE to see your stars. Please email me at susanbreensilvy@yahoo.com. I look forward to seeing them! Have a wonderful holiday season! hi! i have a question about the stars. should i tangle on them first, then score the creases? or should i score the creases and then add the Zentangles? The stars are SO beautiful, you must be so talented to make them (: great job!! Hi Abby. I score the stars and then tangle. By scoring first, you can see where the folds will be which helps if you are trying to center your tangles. Enjoy making your own and have a great holiday. 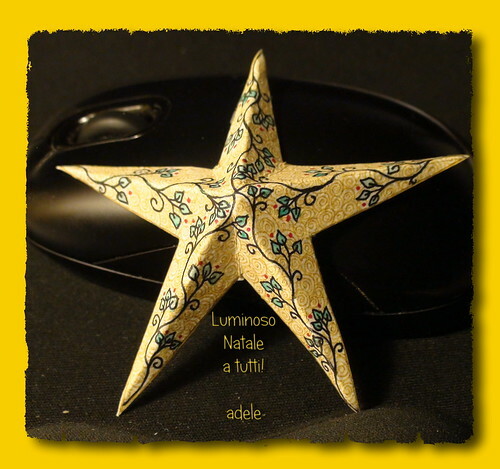 And here are my Christmas greeting with the last star… Thank you!!!! It’s the little changes that produce the greatest changes. Many thanks for sharing!